BLANTYRE-(MaravioPost)-The country’s Vice President Dr Saulos Klaus Chilima, who is heading the now fast-growing United Transformation Movement (UTM) on Sunday disclosed that part will field 193 aspiring MPs in all constituencies in the country, all wards in the country for aspiring councilors and a presidential candidate. Chilima was addressing the jam-packed rally at Njamba Freedom Park in Blantyre where he strongly put it that a “new Malawi is possible” as he reiterated his stance against corruption. 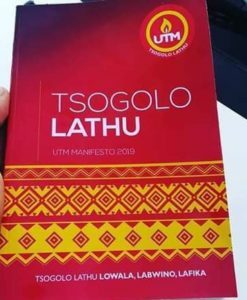 The UTM leader confidently, amid clapping and ululation from the supporters, told the gathering that UTM was “seriously determined” to turn-tables around for the country, saying he will not shield anyone involved in corruption when UTM takes over government next year. Before urging people to register in large numbers in the ongoing voter registration exercise to be able to vote in the elections and remove “thieves”, Chilima threw out a proverb as has been his style of being witty and humorous orator . “To show that we are serious about this, we will pay nomination fees for all these candidates [to the Malawi Electoral Commission] in advance. “When you see hungry goat running away from green pasture it was feeding on, just know there must be dangerous ants hiding in the grass,”said Chilima.